Figure 2. The proteomes of radicle, endosperm cap, and whole cress seeds differ. (A) Comparison between representative silver-stained 2-D gels of whole dry cress seeds, 8 h imbibed cress radicles and 8 h imbibed cress endosperm caps. Note that the storage proteins (marked by a black square) are most abundant in the whole seed, followed by the radicle. The cap displays a low abundance of storage proteins. 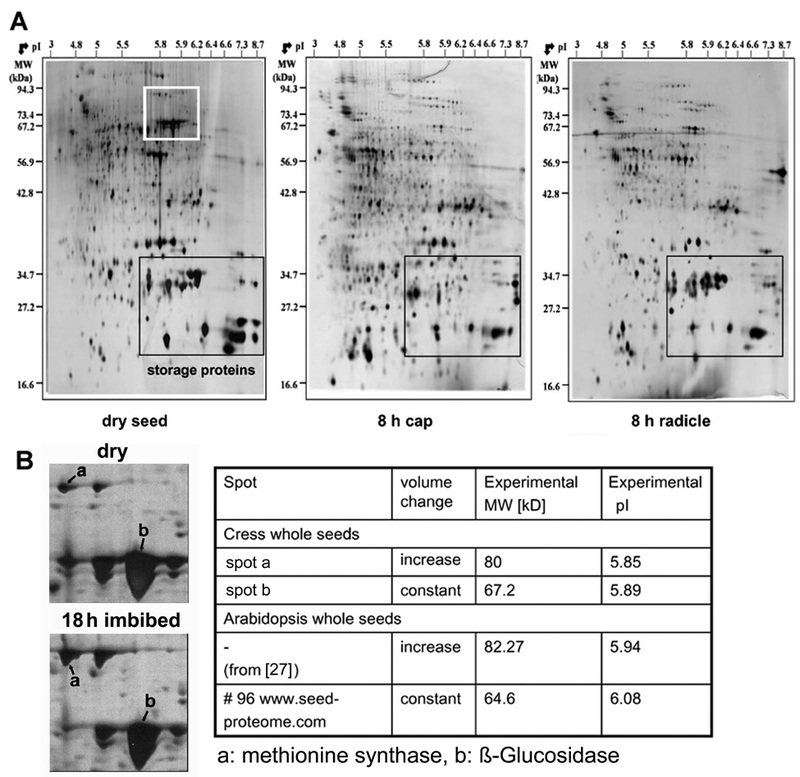 (B) Many cress proteins can already be identified by the similarity of their migration and their volume changes during germination in whole seed extracts to their Arabidopsis orthologous gene products. The section of the dry seed - 2-D gel marked with a white square in (A) is enlarged and compared with the corresponding section of a 2-D gel with extracts of whole cress seeds at 18 h after imbibition (‘‘18 h imbibed’’). The experimental MW and pI of the two spots marked a and b are given in the table to the right of the gel sections and compared with the corresponding Arabidopsis spots. The values for Arabidopsis are taken from  and www.seedproteome. com, respectively.